Details in The Record, https://www.therecord.com/news-story/744...rse-trail/ . 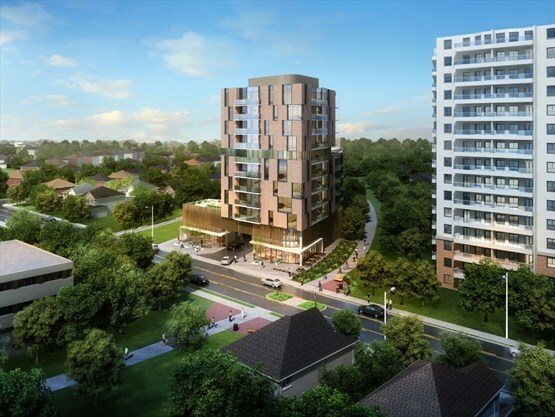 Quote: A developer is proposing to build an 11-storey, 102-unit condo tower on Queen Street South between the Iron Horse Trail and the Canadian National Railway tracks. Not the most beautiful condo rendering I have seen, but still a huge improvement over what's there today. I'd like to see a rendering from the rear, but it does look good! From the article: "The developer is proposing putting in a one-storey parking garage along the railway tracks, with a couple of storefronts facing Queen Street." Nice to see some shop space here. I'm very happy to see this - we usually walk by here a couple of times per week and have been missing Nougat. I am hoping for a cafe/restaurant with a patio facing the trail. Quote: As well, the constraints of the wedge-shaped lot mean that the building will be set back from David Street. Daniels said he's been talking to the city about creating a parkette at that end which would blend in with the Iron Horse Trail. This would be such an improvement from the current state. What, you don't like the metal sheeting wall??? Just posting the render. Very nice project. I like the podium, but I'm not a fan of the "random" window schemes on towers. (07-19-2017, 11:50 AM)tomh009 Wrote: I like the podium, but I'm not a fan of the "random" window schemes on towers. I feel the opposite. I love the randomness. Very cool, but is that a driveway to parking right in the middle of the podium? It's like art ... we all have opinions, and the other guy is always wrong! > Very cool, but is that a driveway to parking right in the middle of the podium? Looks like it, but I suspect they [did not] have many options. I think it probably can't go beside the rail line for regulatory reasons (they already plan for an engineered crash wall on that side in lieu of a berm/setback). Right beside the IHT seems awkward to me due to the lot's wedge shape. You're probably right EdM. Logical location given those restrictions. (07-19-2017, 11:10 AM)urbd Wrote: Just posting the render. Very nice project. The Record article mentions public comment are welcome until July 26th and the Post article mentions how to appear as a delegation, but where are the full details posted to have an informed opinion? (07-23-2017, 09:22 PM)Pheidippides Wrote: The Record article mentions public comment are welcome until July 26th and the Post article mentions how to appear as a delegation, but where are the full details posted to have an informed opinion? This is always a good question for Kitchener - unlike Waterloo, which posts full details of rezoning applications in an easy to access spot.